It was illegal to publish the proceedings of the Parliament. "So the compilers of periodical publications adopted a covert method of giving the Debates. The Gentleman's Magazine published the "Debates in the Senate of Lilliput" and the London Magazine gave a "Journal of the Proceedings and Debates in the Political Club. "** These and other periodicals gave print space to the debates without incurring the notice of the Houses of Parliament. 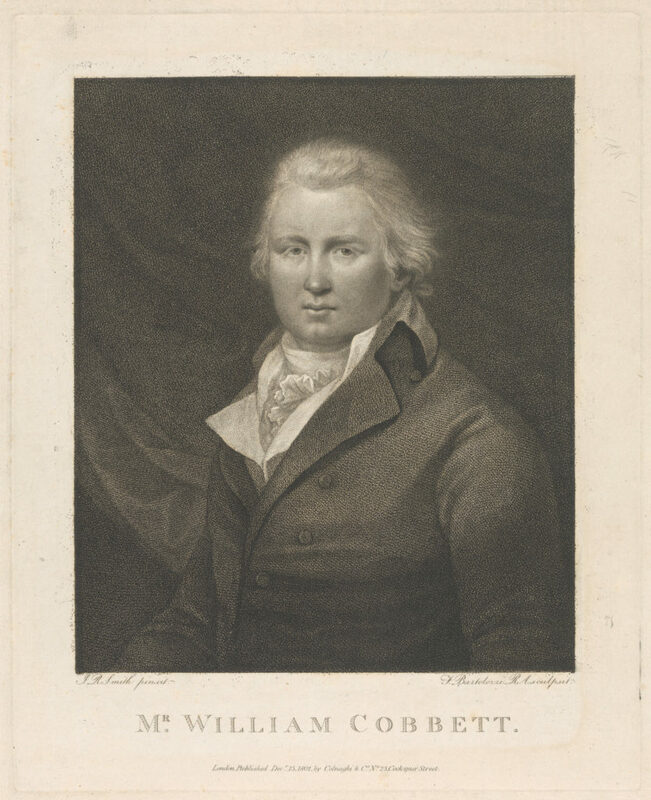 William (no middle name) Cobbett was born on March 9, 1763 in Farnham, Surrey and was taught to read and write by his father who was a farmer and publican. At twenty, he went to London and served as a clerk in Gray's Inn for nine months, at which time he joined the regiment and was stationed in Nova Scotia. He used the spare time to educate himself, particularly in English grammar. While in New Brunswick, he gathered information on some corrupt officers and wrote The Soldier's Friend (1792) protesting against the low pay and harsh treatment of enlisted men. Fearing indictment, he went to Philadelphia in 1793 and became a controversial political writer and pamphleteer, writing from a pro-British stance under the pseudonym Peter Porcupine, in The Porcupine, published 1800-1801. Immediately, he started his Political Register questioning the policies of the Pitt government. His strong voice for parliamentary reform landed him in prison for "treasonous libel" and he was sentenced to two years in Newgate. On his release, a dinner in London, attended by over 600 people, was presided over by Francis Burdett, who shared Cobbett's view on parliament. He continued his voice in the Political Register and incurred the wrath of the government again. Suspecting he was going to be arrested for his "seditious writings" he fled to the United States. For two years (1817-1819), he lived on a farm in Long Island where he wrote Grammar of the English Language and with the help of William Benbow, continued to publish the Political Register. When Thomas Paine died in 1809, Cobbett planned to take his remains for a proper burial on his native soil, but his remains were still in Cobbett's possession when he died in 1835 over twenty years later. Note: Cobbett published many treatises, books, pamphlets and articles. In addition to his Parliamentary Debates he wrote The American Gardener (1821), which was one of the earliest books on horticulture published in the United States. In 1829, he wrote The English Gardener, which has been compared with other important books on gardening. He is best known for his book in 1830, Rural Rides, written as he rode around the country making observations on what was happening in the towns and villages, and which is still in print today.